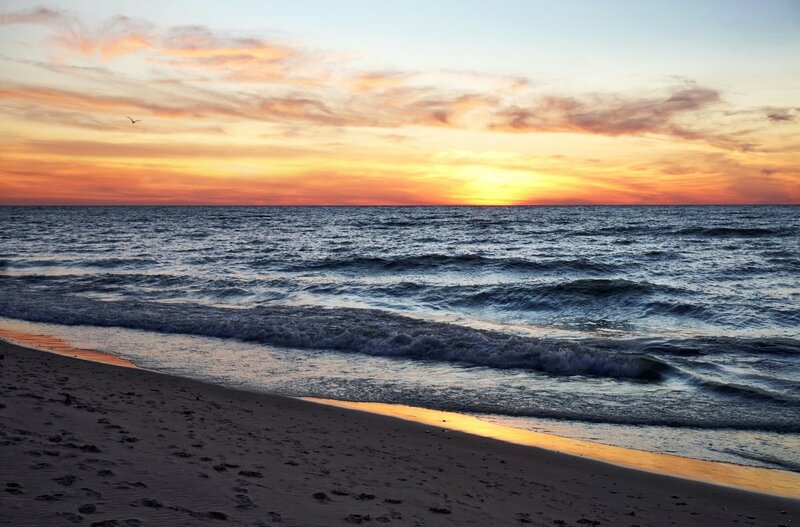 Looking west towards Chicago and Milwaukee from our Lake Michigan shorelines during a beautiful September sunset is a favorite past time for us Michiganders. Another favorite past time for all citizens of the Great Lakes States is combing the beaches for interesting treasures. It can be a very settling and spiritual experience. 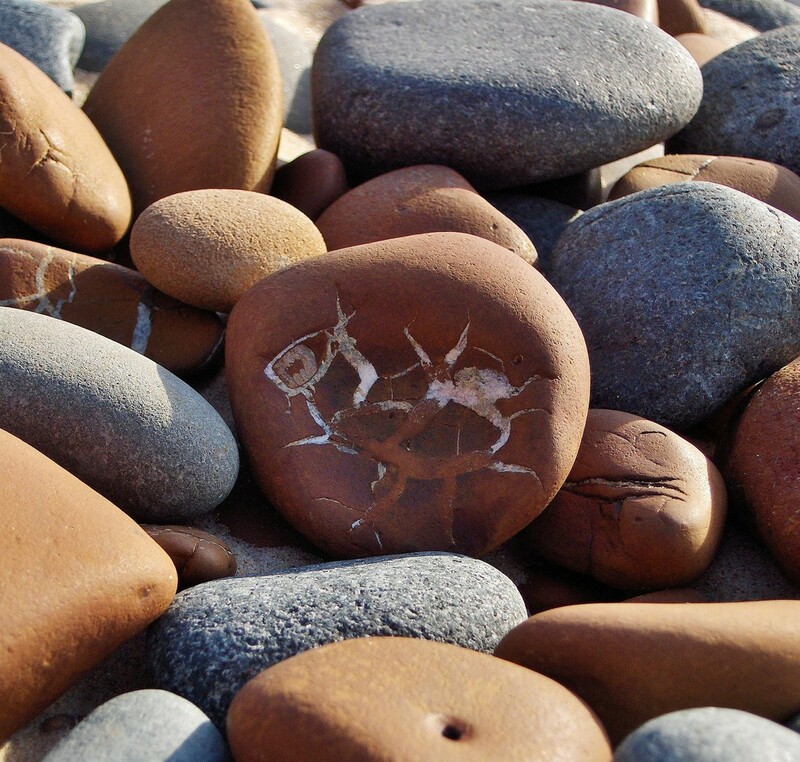 Beach goers are certain to bring along a bucket or two in case they find cool fossils to collect or beautiful samples of driftwood, or perhaps sand smoothed colorful pieces of beach glass, but especially fascinating rocks. I have enjoyed collecting all the above from my nearby Southwestern Michigan beaches and would like to share with you some of the rocks I have discovered washed up onto the shore. 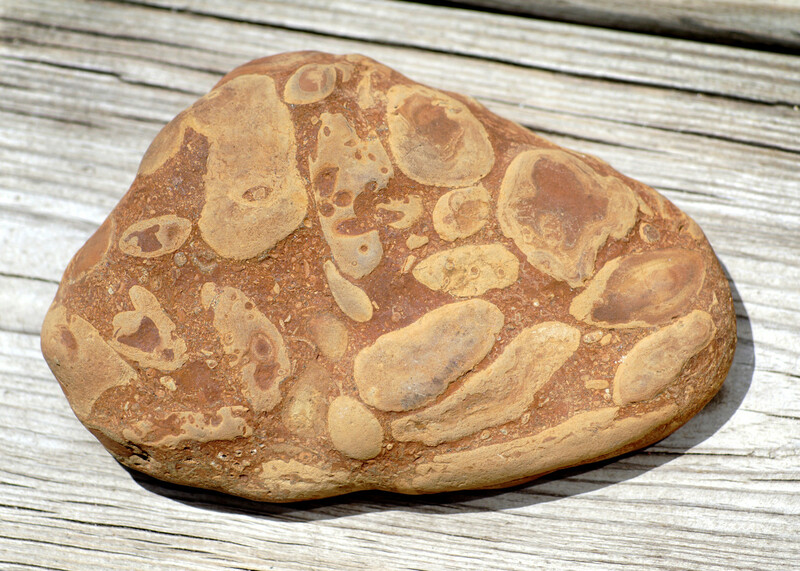 Some samples are very common while the most unusual beach rocks are found only in certain places around the world. I will present beautiful rock photographs for your enjoyment and pass along fascinating information about them! Aah, where to begin . . . the above photo is an example of what I often find during the spring time due to winter's push of ice and snow depositing the rocks further up onto the shore. Later in the season, the waves move the rocks back into the water along the shoreline or the wind buries them with sand. So I find spring to be the best season for rock hunting. 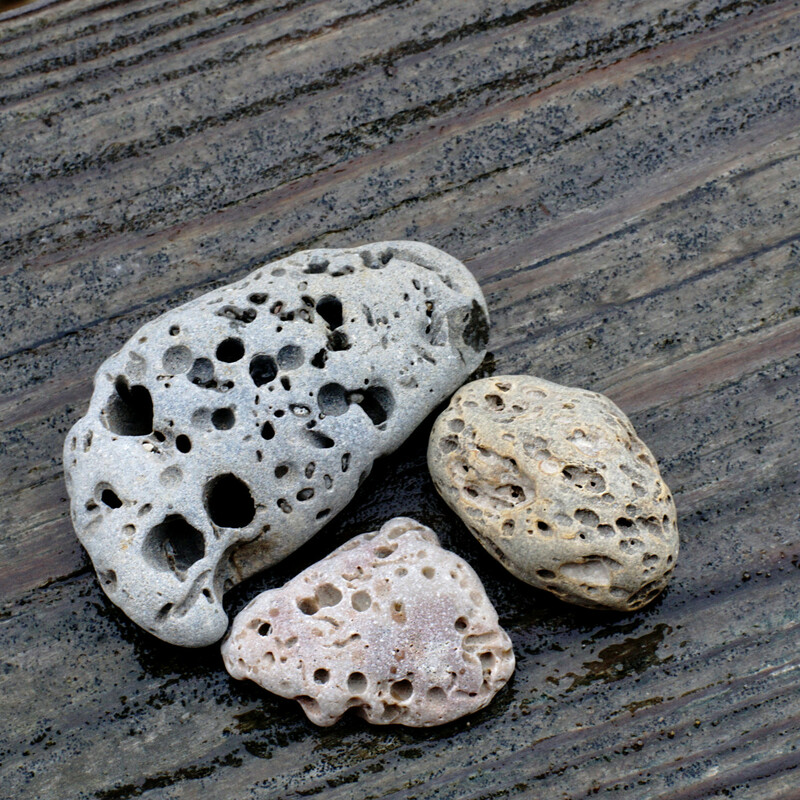 But I must mention, some Lake Michigan beaches have very few stones while other pockets are loaded with them. 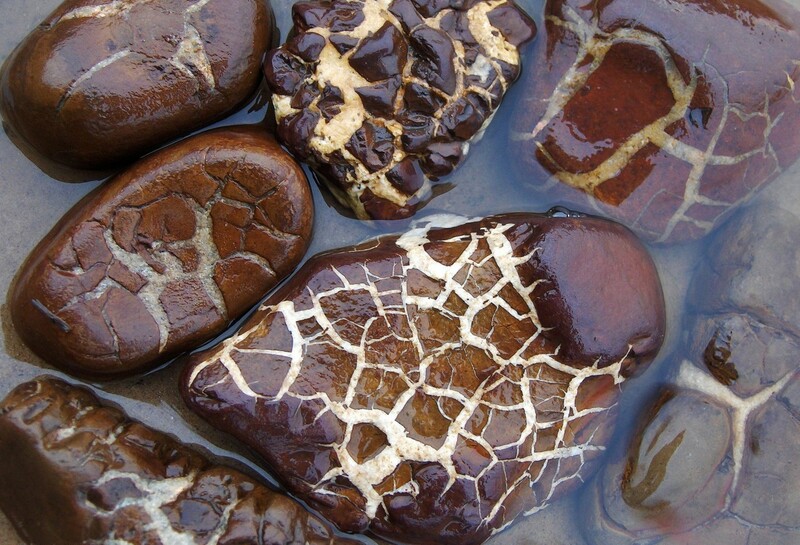 The photo above shows samples of basalt beach stones together with Septarian brown stones. Basalt is the most common stone other than granite found along the shoreline where I live in Southwestern Michigan. I was especially drawn to this assemblage lying on Pier Cove Beach by the way the late afternoon sun lit up the contrast between the warm and cool complimentary colors and so I snapped away with camera in hand! 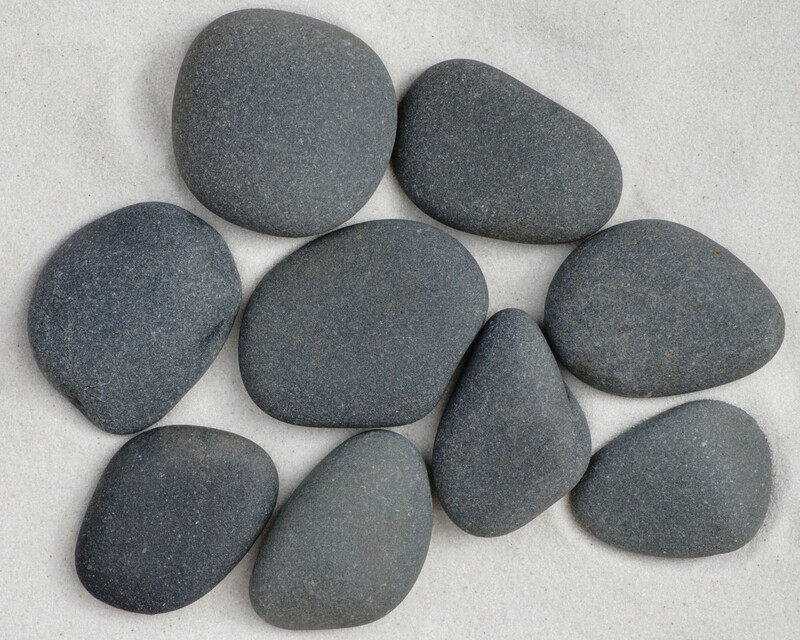 Note: One consistency you'll find with beach stones and rocks is their smoothness and rounded edges. That's due to the wind and waves pushing the stones against the sand acting as a polisher. 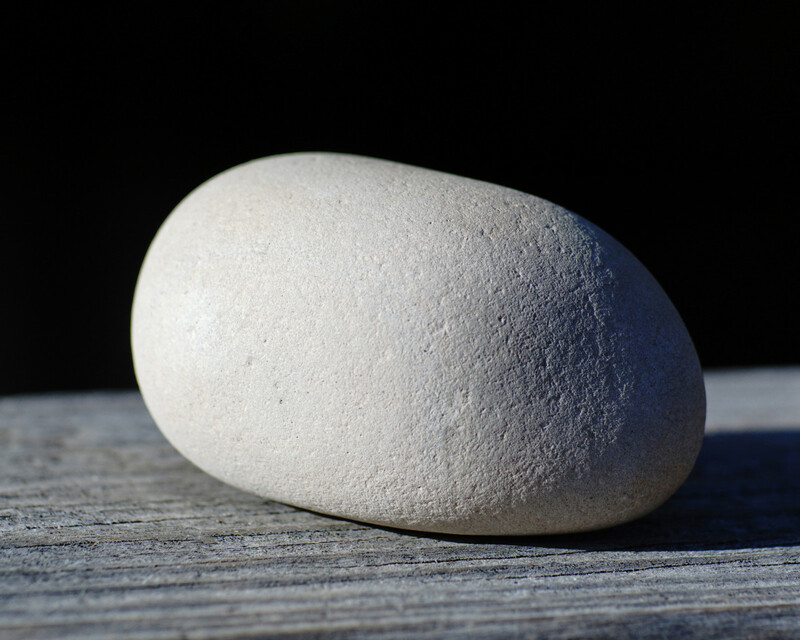 It's also an indication as to how far a stone has traveled from its original formation. 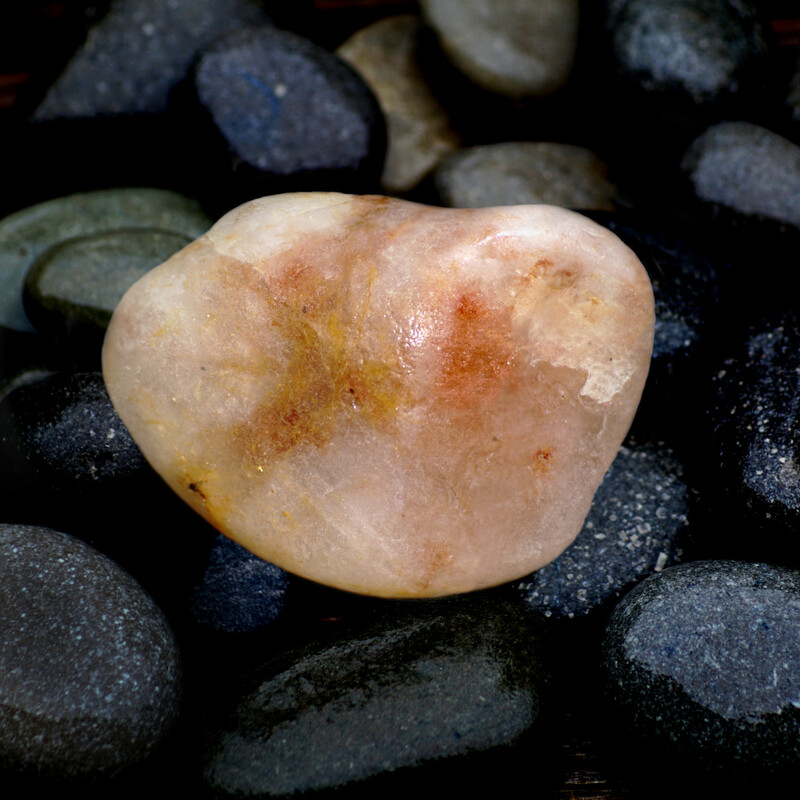 The smooth rocks feel so good in your hand with an incredible healing effect! This article includes, in order, various types of basalt, septarian brown stones, limestone, granite, gabbro, diorite, gneiss, schist, sandstone, silt stone, mud stone, geodes, chalcedony and agate. For a basic understanding of rocks to begin with, rocks are combinations of minerals and minerals are combinations of chemical elements. Basalt is a fine-grained, dense volcanic rock . 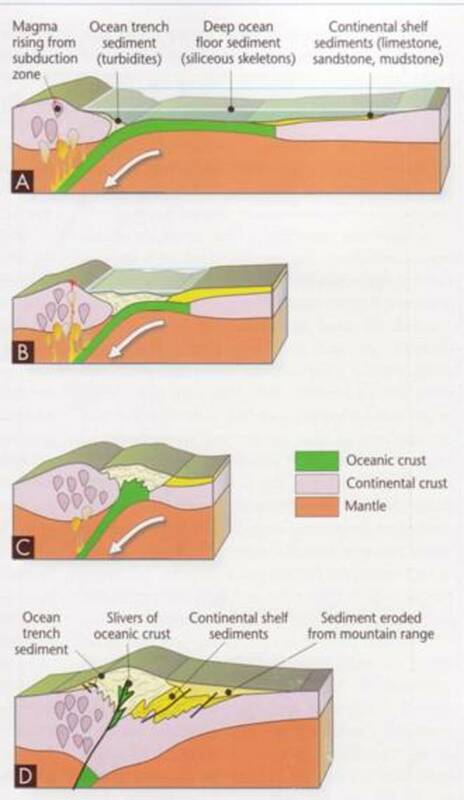 . . the original rock of Earth's crust from which almost all other rock types have evolved. It covers more of Earth's surface than any other rock. Formed from ancient molten rock that quickly cooled (extrusive type) when it reached the surface is the reason for its fine grained, heavy density before gas bubbles, crystallization or foreign materials could infiltrate. Most extrusive igneous rocks in Michigan were formed from ancient quiet lava flows which reached the surface through long cracks and crevices; also, from remnants of mountain peaks that have withered away. Just imagine, when you find a basalt rock on the beach, you're holding in your hand a billion year old slice of earth. Basalt is composed of plagioclase and pyroxine minerals. These terms are used often when researching rocks. Pyroxine is a class of rock-forming silicate minerals, generally containing the chemical elements calcium, magnesium, iron and occasionally the mineral olivine. In lesser quantities, basalt may also contain the mineral quartz, hornblende, nepheline, orthopyroxene, etc.The Plagioclase is a group of related feldspar minerals that essentially have the same formula but vary in their percentage of the chemical elements sodium and calcium. Note: Many explanations are simplifications for us non-geologist laymen as with much of the information I have provided! Researching rocks can get pretty intense and involved. Basalt is usually grey to dark grey, but can rapidly weather to brown or rust-red due to oxidation of its iron rich minerals; and further exhibit a wide range of shading due to regional geochemical processes. Ophitic Basalt looks like a basalt rock that has been decorated with lighter colored painted snowflakes. They come from tiny feldspar crystals that were in the lava. Because the crystals have worn at different rates than the basalt, there is often a slight mottled texture to these stones. The sample above was a small boulder found on the beach and was quite heavy to carry in my arms! 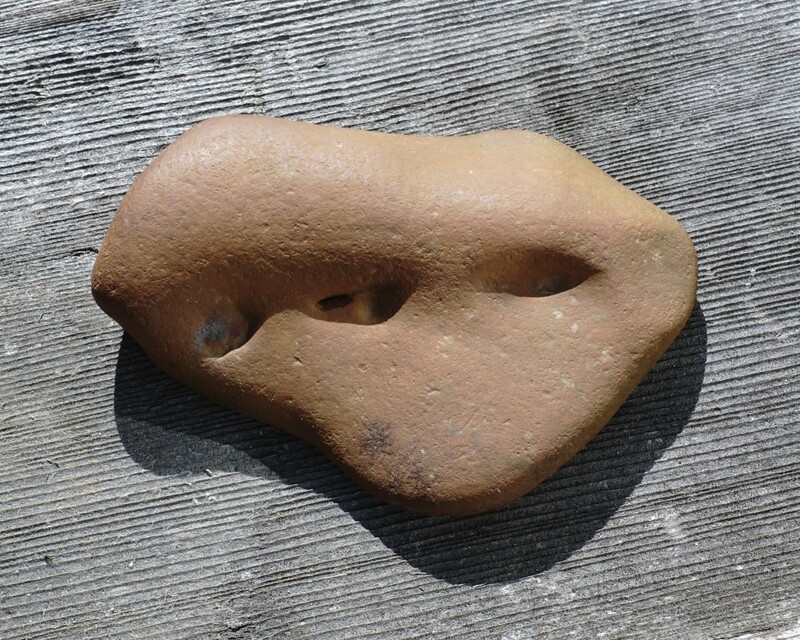 Occasionally, we find these most curious pitted stones on the beaches. After some research, I'm glad I finally understand how they got that way. They are called "Vesicular Basalt". It means basalt with textures and if the deep pits (visicles) cover more than half the surface of the rock, it's called "scoria". The basalt making molten rock cools down too fast before gas bubbles deep inside Earth's surface have the chance to make their way out of the lava. When the lava reaches the atmosphere, the bubbles remaining in the cooling lava can blow out leaving their spherical pitted impressions. The vesicles can fill in with other minerals and the fillings are called "amygdules". The basalt is then referred to as "amygdaloidal basalt". If the lava flow is in motion when the blow holes are being formed, the holes may be drawn out and elongated as you can see in the sample above. What is Porphyry rock? In various rock types (in this case basalt) when usually one mineral is in large crystals and embedded within other finely ground minerals making up the mass, it's porphyry or porphyritic rock. You can tell the porphyry basalt apart from the above amygdaloidal basalt with the absence of empty pits. These are more rare to find on the beach. 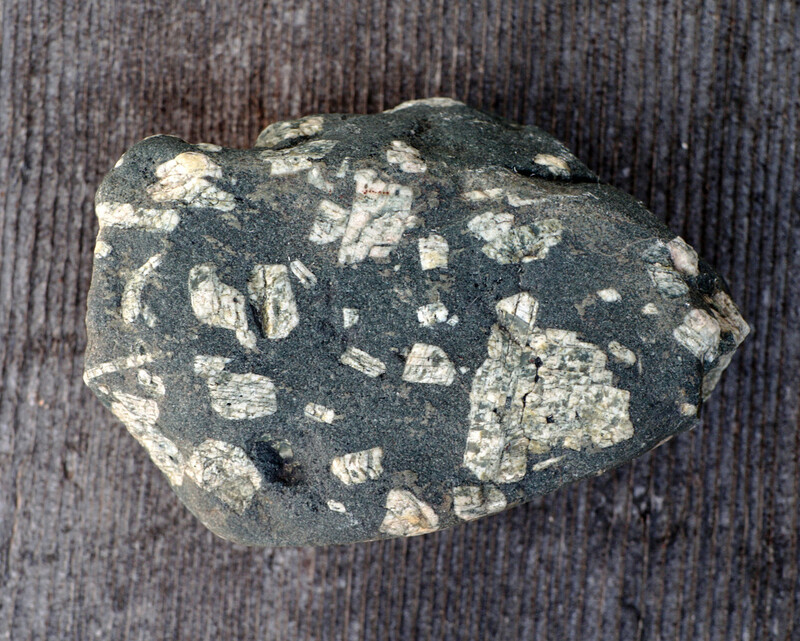 This sample of basalt has a greenish cast due to the inclusion of the mineral olivine. Septarian Brown Stones are typically brown due to the iron content. Composed mainly of mud and clay that formed on the ocean floor around 50 million years ago. At some point, perhaps from dehydration, the stones cracked and later calcite infiltrated the open veins through ground water gradually filling them up. 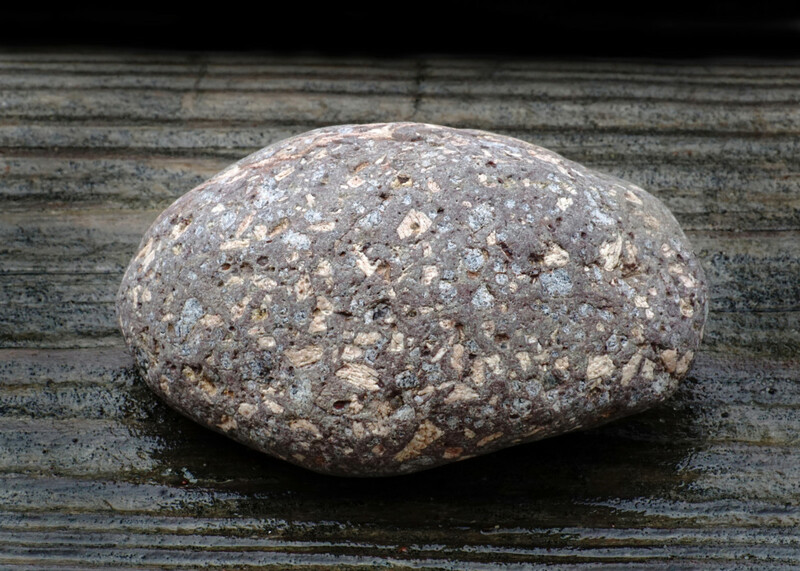 This is one of those types of stones that are found only in certain areas of Southwestern Michigan and very few other places around the world. Locals call them "Lightening Stones" for obvious reasons and/or "Turtle Stones". The photo below is a good example of the cracking process. 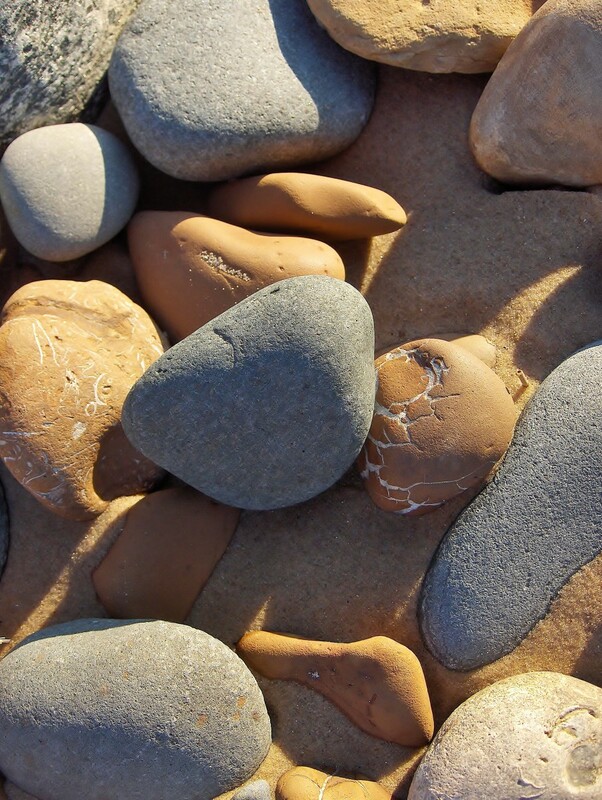 Sometimes the stones break completely apart and we find thousands of the smoothed broken off sections on the beach. 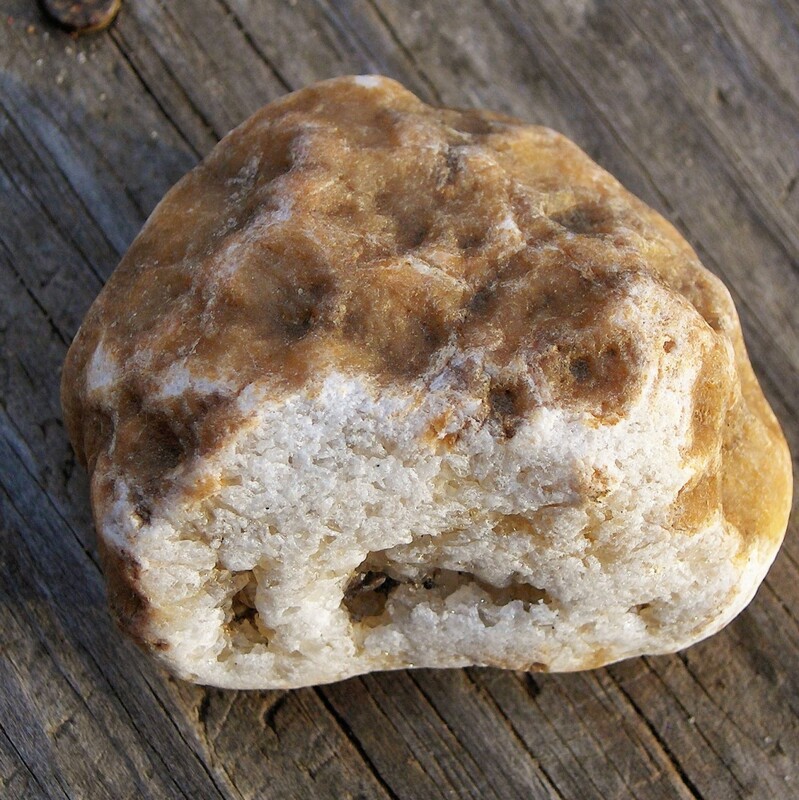 There is a great amount of limestone samples lying on the beaches of the Great Lakes, including several varieties. I've provided information about a few, but briefly to provide a basic definition: Limestone is a sedimentary rock composed mainly of skeletal fragments of marine organisms such as coral, clams and mollusks. Its major materials are the minerals calcite and aragonite which are different crystal forms of the compound calcium carbonate. Marine animals grow their shells by extracting calcium carbonate from the water, so fascinating to me. 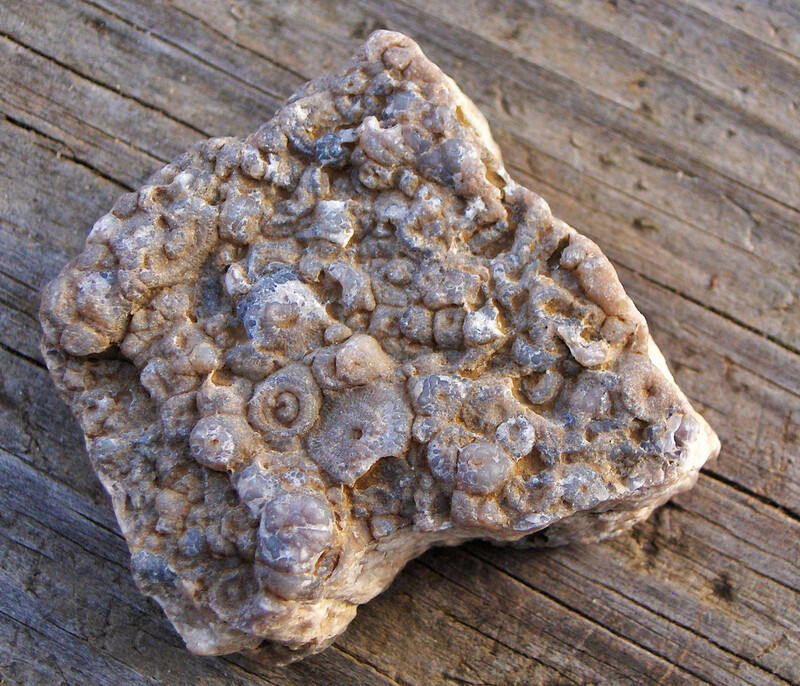 Crinoidal Limestone is limestone that contains a significant amount of crinoid fossils. Crinoids are branching, stemmed, plant-like organisms (mostly extinct) beginning their reign from 500 mya. But they are actually animals that sift microorganisms from the ocean water. With a keen eye, we often find crinoid "sea lily" individual stems or broken off cheerio-shaped pieces from the remains of these marine creatures. Native Americans weaved necklaces with them. I provided several samples of fossiliferous limestone to demonstrate how abundant they are on our beaches, especially in Southwest Michigan. 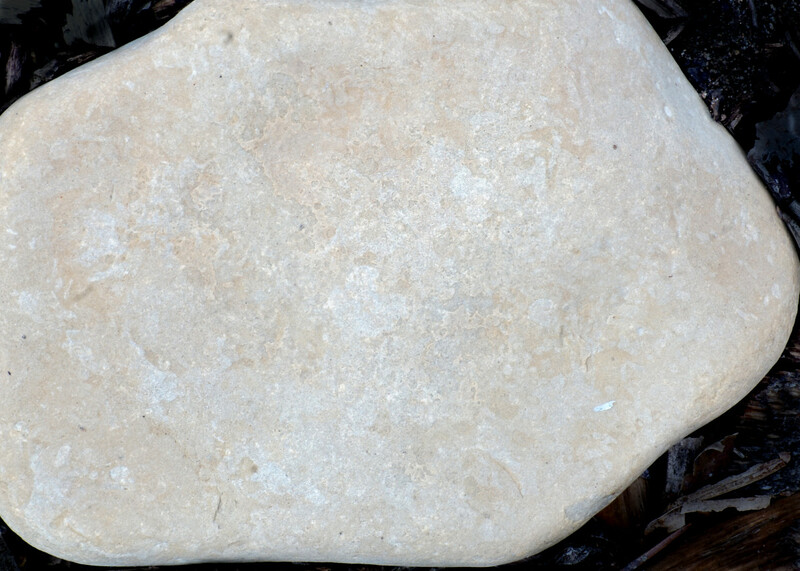 Fossiliferous limestone contains obvious and abundant fossils such as shells of mollusks, clams, crinoids and other invertebrate organisms that produce the limestone. 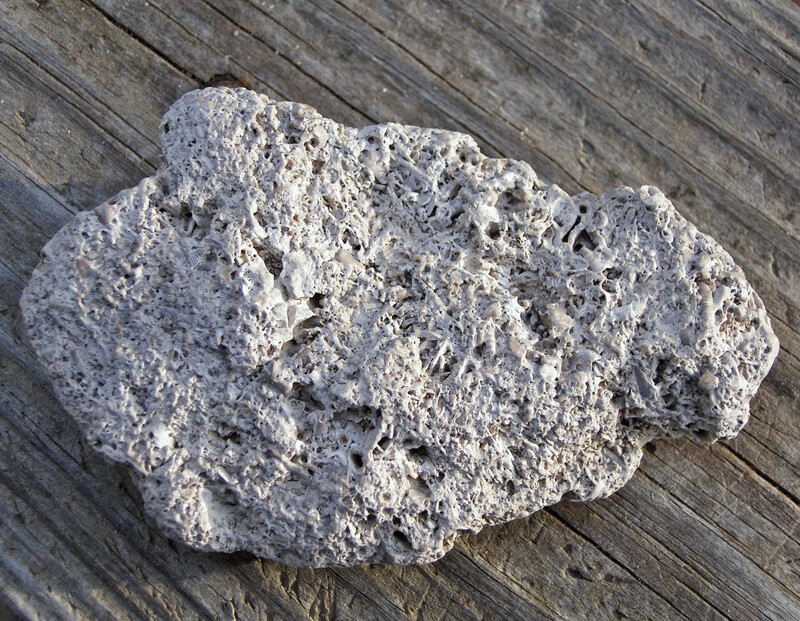 Like other limestone, fossiliferous limestone is composed of the mineral calcite. 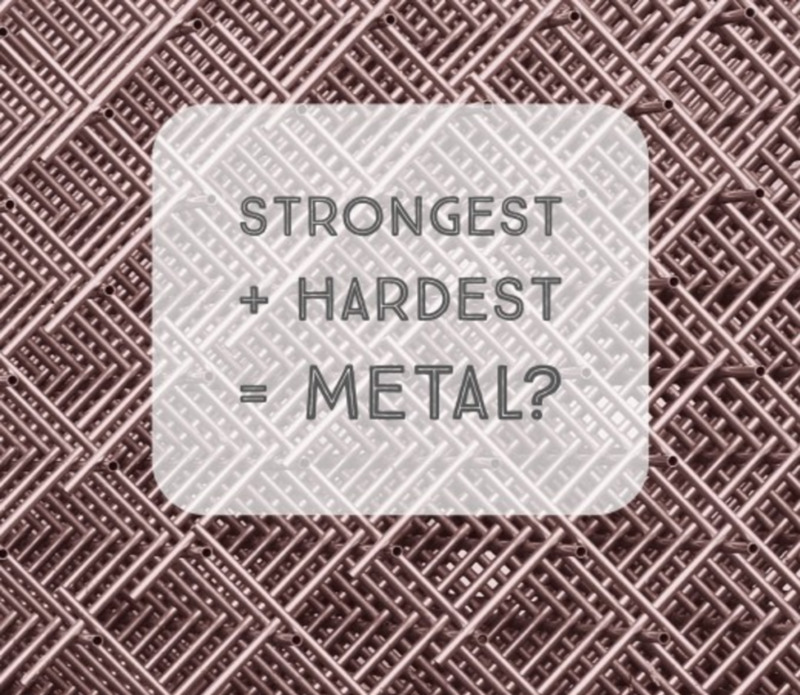 It can be white, pink, red, reddish brown, gray and even black depending on other imposing minerals. 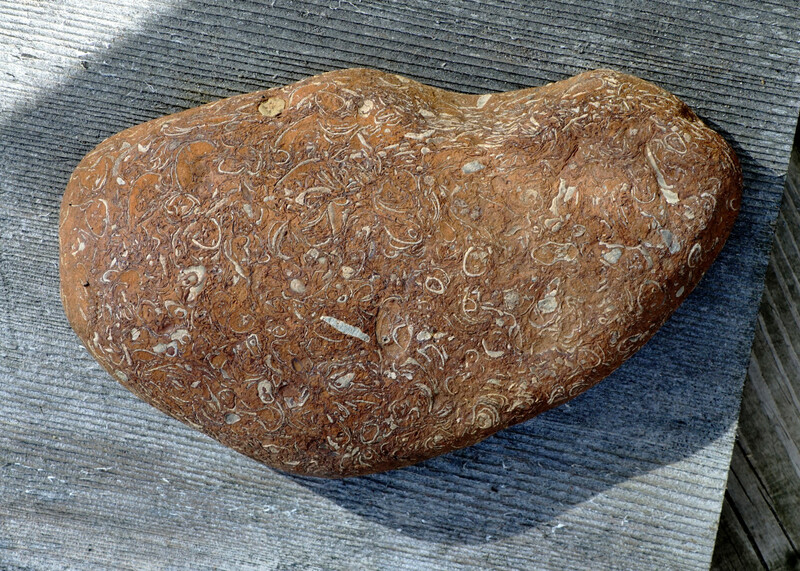 We find many of the redddish brown colored due to the iron infusion. Tuffa Limestone is a porous limestone that forms from the precipitation of calcium carbonate, often at a hot spring or along the shoreline of a lake where waters are saturated with the chemical compound. 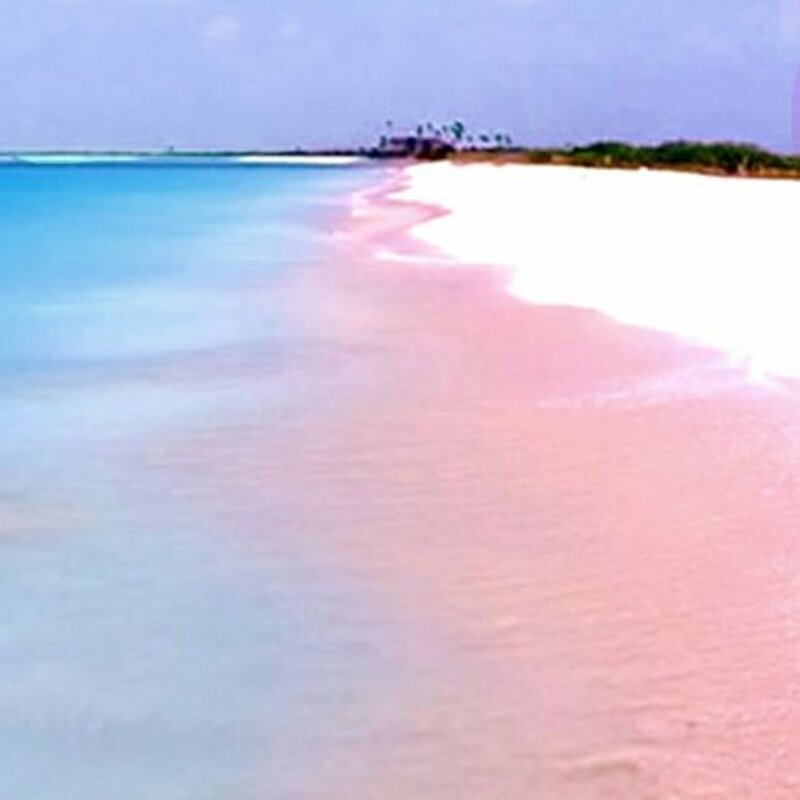 Compact Limestone composed primarily of tightly packed calcium calcite derived from the remains of marine organisms can vary in color from white, yellowish, pink, red, gray or even black depending on minerals other than calcite. It has a very fine texture and is denser than the other types of limestone. 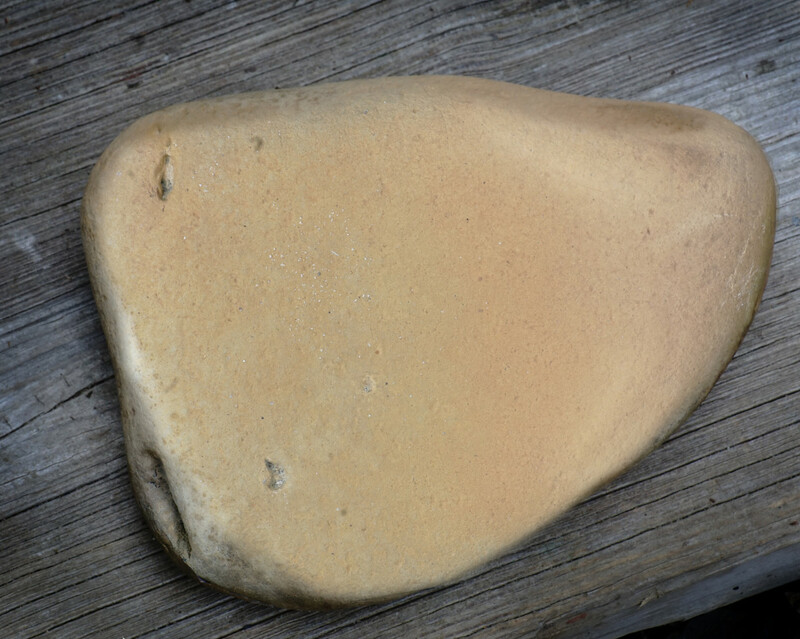 The first sample shown above is a large piece with rounded edges but has been flattened, hence the name "shingle" for flat stones found on beaches. I just love finding the perfectly round, or egg shaped samples of smooth white limestone rocks! Perhaps the first sample I provided is dolostone or dolomite, not to be confused with the mineral. It could very well be a dolomite rock which is usually quite similar to limestone and the two are often indistinguishable in the field. Geologists carry small bottles of diluted hydrochloric acid to test carbonate rocks. 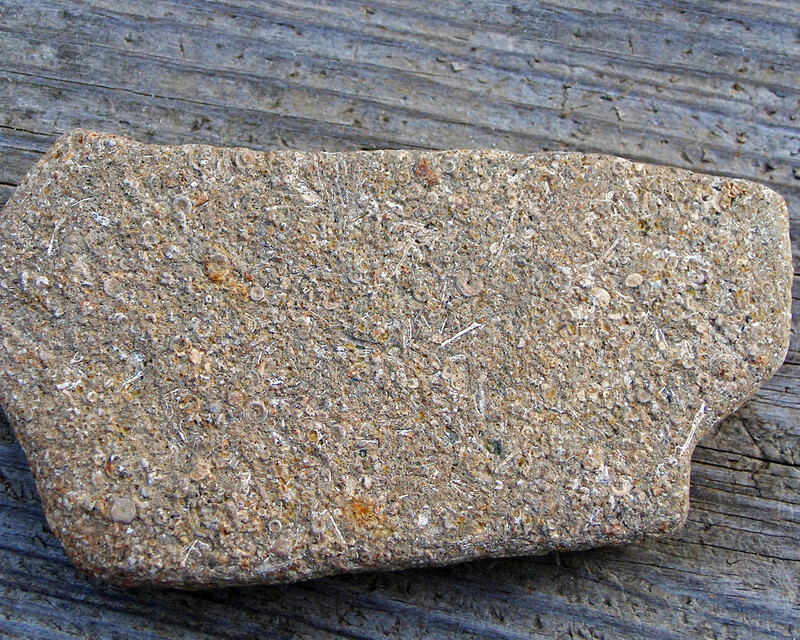 The most common type of dolomite rock is a former limestone that was dolomitized. Dolomitization means that calcium carbonate (minerals aragonite or calcite which make up limestone) were replaced by calcium magnesium carbonate (mineral dolomite) through the action of magnesium-bearing water percolating the limestone or limy mud. Dolomite rock is another very common sedimentary rock. Especially older carbonate rocks formed before the Mesozoic tend to be dolomite whereas younger carbonates are predominantly various limestone. 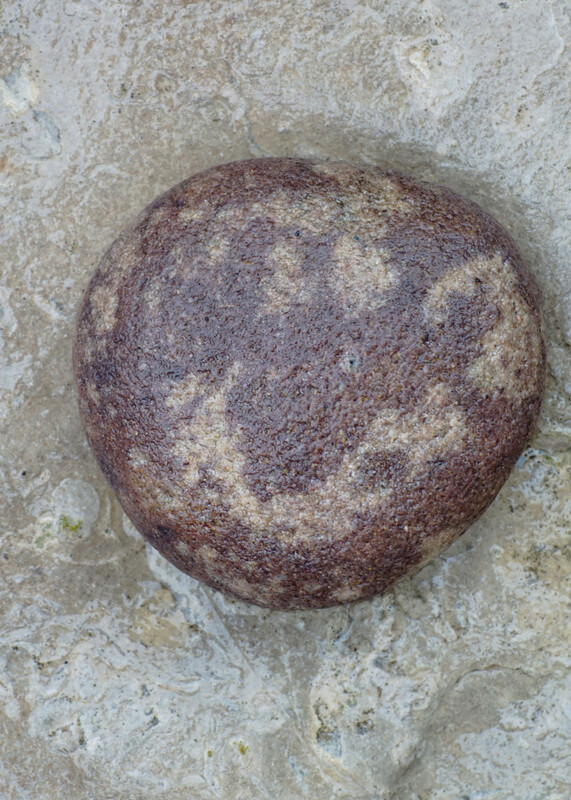 It's thrilling to find these round bird-egg shaped granite stones on the beach. With their varied colors and patterns, they create beautiful works of art. 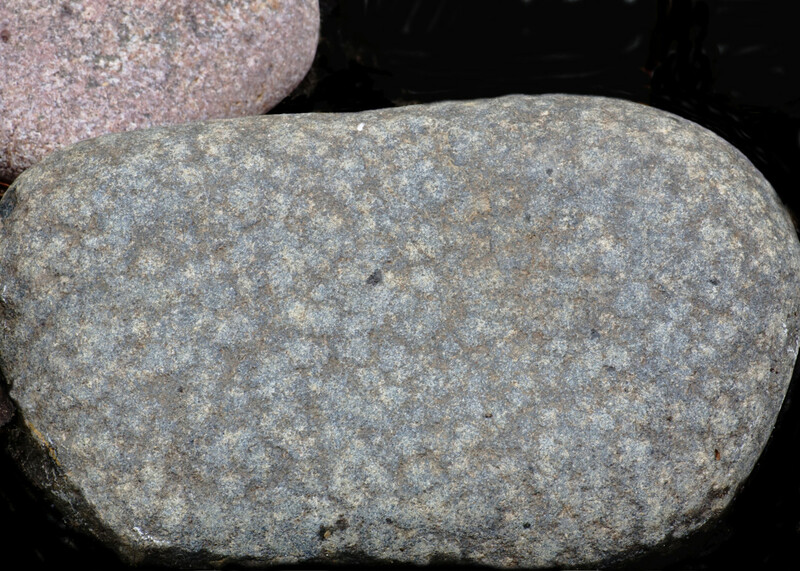 Granite is another type of rock we find quite often on our Lake Michigan beaches in the form of pebbles, cobble stones and boulders. Granite makes up 70–80% of Earth's crust. It's an igneous rock that cooled slowly deep within the Earth allowing the slow process of crystallization of molten rock (intrusive type). The course grained minerals are easily seen with the naked eye. Colors vary from red, pink, gray, or white with black grains depending on the amount of each mineral. 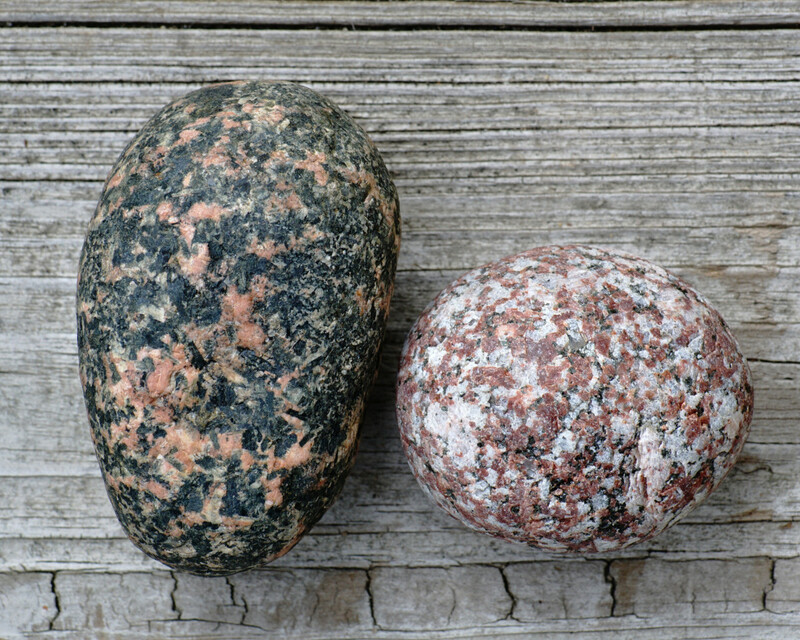 Above, the two artful samples of granite demonstrate the variances in color depending on the mineral content, of which both have one or two that dominate. Can you guess their mineral content based on color? Although granite underlies much of the earth's surface, it doesn't often rise up to where we can see it.The Canadian Shield is an enormous granite formation covering most of the country and is the nearest place to Michigan where granite is found above the crust. So how did it get to Michigan's shores? You guessed it . . . glaciers from past ice ages scraped up the material and brought it south. As a reminder, porphyry or porphyritic rock is a finer grained igneous rock containing large jagged crystals of feldspar. The porphyritic crystals are generally white, pink or orange. 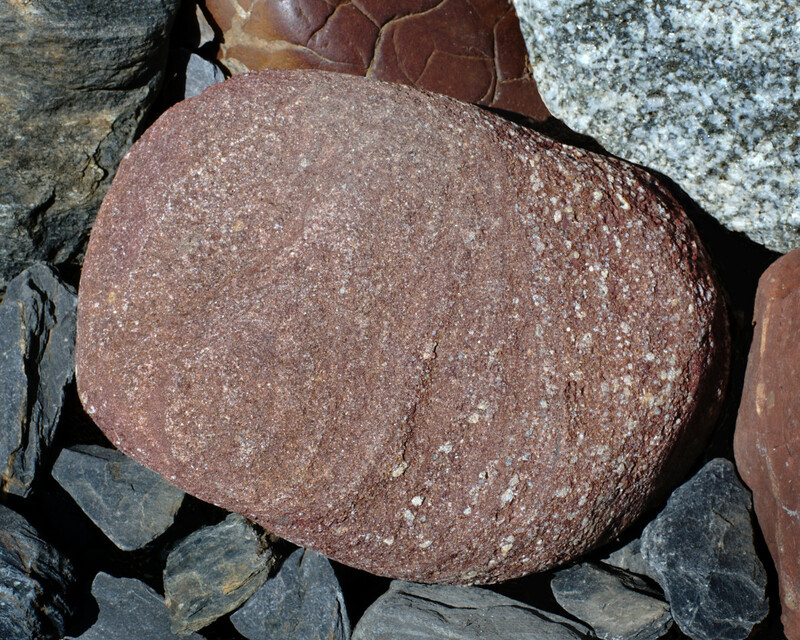 Porphyry rock is mostly made up of a basalt base, but sometimes granite with jagged, rectangular crystals. With granite, it’s harder to tell apart the porphyry because of the already coarse grain, but look for stubby, square or hexagonal crystals that are larger than the other grains within the granite rock. You can clearly see this in the sample I have provided above which was found on our Lake Michigan beach. Here's how it happens: As the feldspar begins to crystalize, the process is disturbed when the molten rock is quickly erupted, freezing the well-formed feldspar crystals in place while the rest of the rock quickly cools and fills in around them. Gabbro is igneous rock which cooled slowly (intrusive) deep below the Earth's surface which caused the minerals to crystallize. It's sometimes called “black granite” for its similar coarse grain appearance, but a large proportion of the iron bearing minerals make gabbro heavier and usually darker colored. Gabbro can also be gray and dark green. 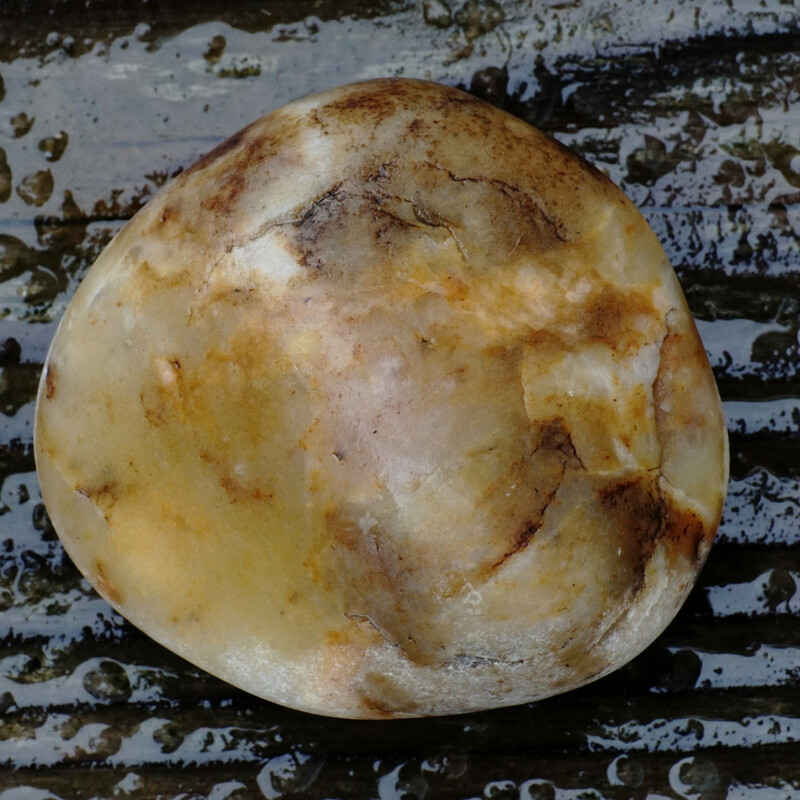 A lesser amount of light-colored mineral grains may also be present. Unlike many other igneous rocks, gabbro usually contains very little quartz, although the sample I collected has a quartz vein running all the way around it. Gabbro has the same mineral composition as basalt (olivine and pyroxene with smaller amounts of feldspar and mica). 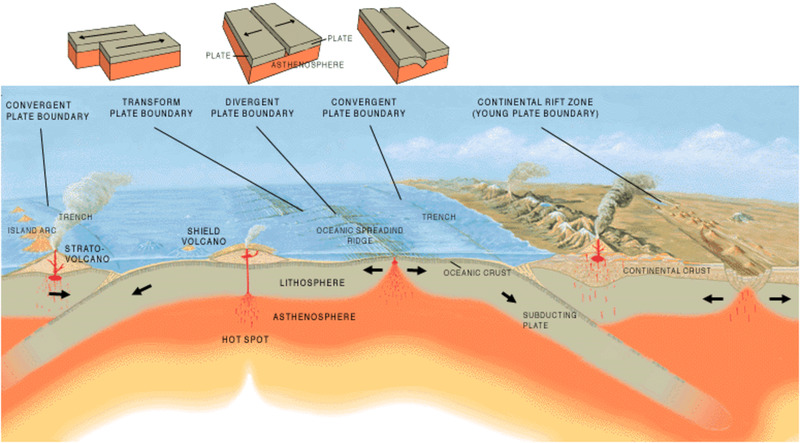 But whether basalt or gabbro forms, depends upon the cooling rate of the magma, not the composition of the magma. While gabbro is coarse grained which cooled slowly (intrusive), basalt is fine grained because it cooled quickly (extrusive). Diorite is another one of several coarse grain igneous stones that can easily be confused with granite. The chemical composition is intermediate between gabbro and granite. The best way to tell diorite from granite is the salt and pepper appearance; and to tell diorite from gabbro is by the darker color of gabbro. If you have in your hand a granite-looking rock with obvious pink feldspar, and more than 20% quartz, you probably have granite, not diorite or gabbro. Phew . . .
Diorite is composed with an almost equal mixture of the light colored mineral, sodium-rich plagioclase (a different type of feldspar mineral) and dark colored minerals such as amphibole, hornblende, or biotite mica. 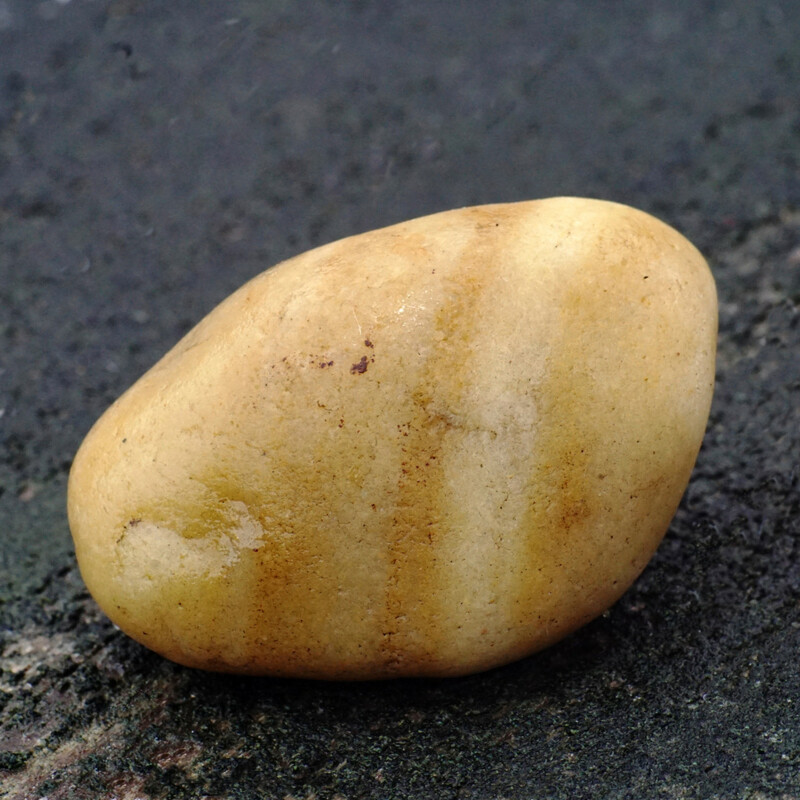 Did you every wonder how some rocks have bands or stripes? 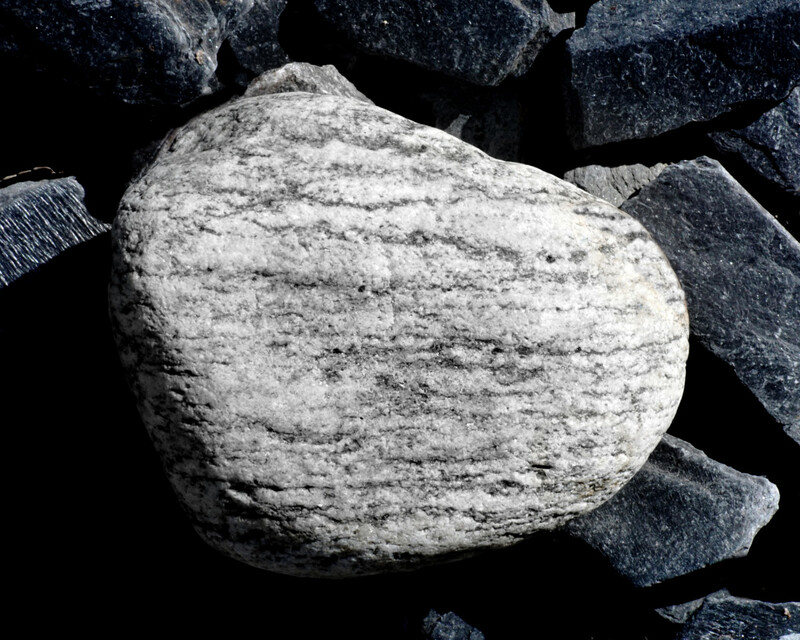 They are some of the most attractive stones, like gneiss for instance, which I only occasionally find on the beach. 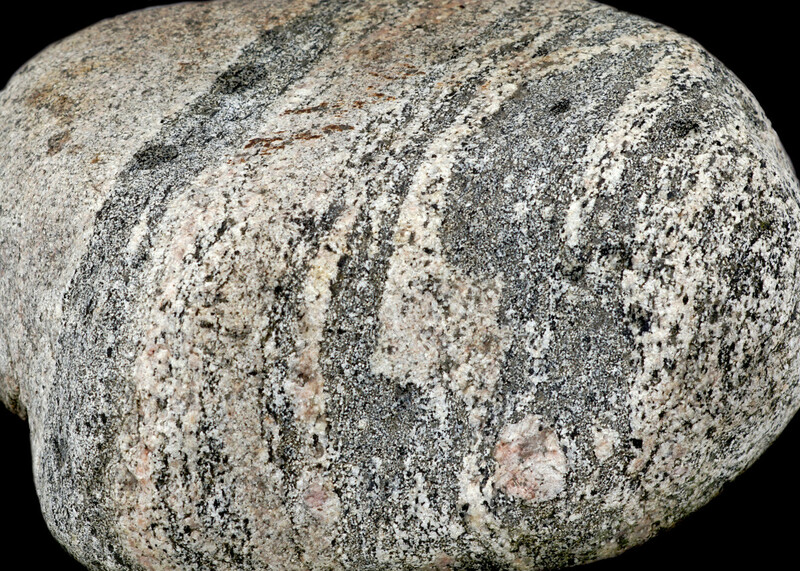 Gneiss (pronounced "nice") usually forms at convergent plate boundaries. It is a high-grade metamorphic rock in which mineral grains recrystallize, enlarge, flatten, and reorganize into parallel bands under intense heat and pressure which make the rock and its minerals more stable. While the chemical composition of the rock may not have changed, the physical structure of the rock will look completely different from the original parent rock. The bands in gneiss are often broken, can be folded (foliated) and can be different widths. Individual bands are usually 1-10 mm in thickness. Layers larger than that imply that partial melting or the introduction of new material probably took place. Such rocks are called "migmatites". Hence, my boulder sample above would be termed “migmatized gneiss”. It is not well understood how the segregation takes place. The granular light-colored minerals in gneiss are calcium, sodium, and potassium rich minerals such as quartz, and also various types of feldspar. The alternating dark-colored layers consist of iron magnesium rich minerals including biotite, chlorite, garnet, graphite and hornblende. 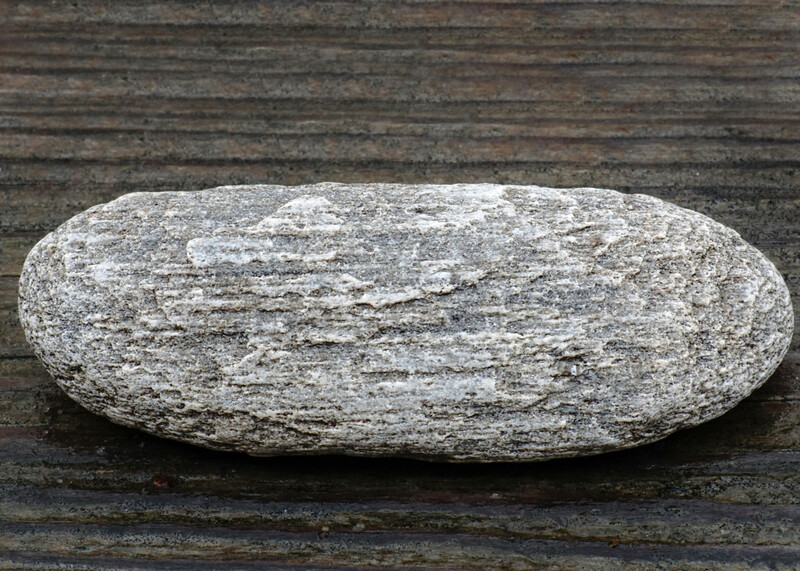 The texture is medium to course, (coarser grained than schist) but as with the other rock types, the gneiss we find on our beaches has been grounded down somewhat smooth. 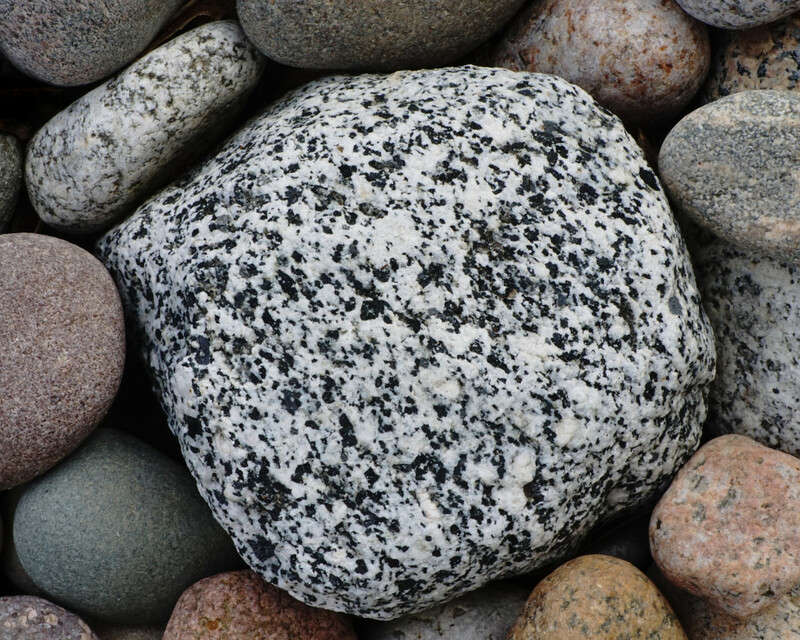 What is the difference between Gneiss and Granite? 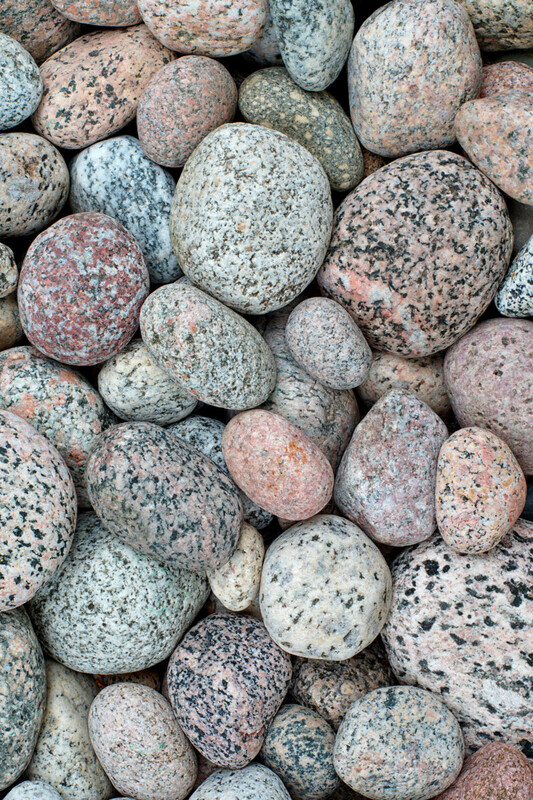 • Granite is an igneous rock, whereas gneiss is formed after metamorphosis of granite. • Most, but not all gneiss is obtained from granite. There is also diorite gneiss, biotite gneiss, garnet gneiss, and a few more. • The mineral composition of granite and gneiss are the same but transformation of granite due to high pressure and temperature leads to the formation of gneiss. Schist is medium grade metamorphic rock, formed by the metamorphosis of mud stone and shale or some types of igneous rock such as slate. The result of high temperatures and pressures are the coarser mica minerals (biotite, chlorite, muscovite) forming larger crystals. These larger crystals reflect light so that schist often has a high luster. Due to the more extreme formation conditions, schist often shows complex folding patterns. Schist shows a tendency to split into sheets. The mica plates are arranged roughly parallel to each other, which is why the rock shows this tendency. There are many varieties of schist and they are named for the dominant mineral comprising the rock, e.g. mica schist, green schist (green because of high chlorite content), garnet schist and so on. I find these somewhat regularly on the shoreline. The lustery shiny samples are much less common of which I've found only one. 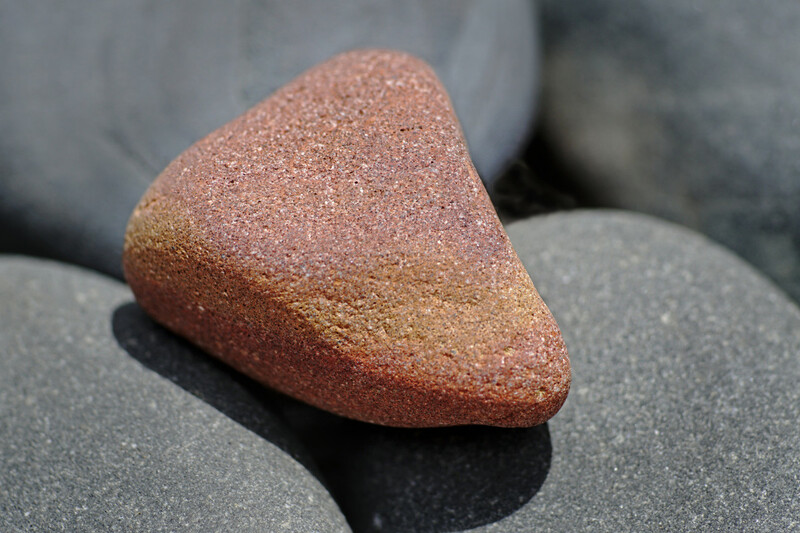 Sand Stone is a sedimentary rock that forms when small quartz sand grains cement together from high pressure while silica, calcium carbonate (calcite) or quartz precipitates and acts like a glue around the grains.These minerals are deposited in the spaces between the sand grains by water. Over the course of thousands or even millions of years the minerals fill up all of the spaces. You can see the tiny particles in the rock as if you were holding sand in your hand. When you're at the beach, try examining the sand very closely for all the tiny quartz crystals and different colors of other minerals contained in it, including feldspars, micas, calcite and clays. Depending on the minerals, sandstone can be white, yellow, pink and almost any color depending on the impurities within the minerals. For example, red sandstone results from iron oxide in the rock and often causes bands of color. 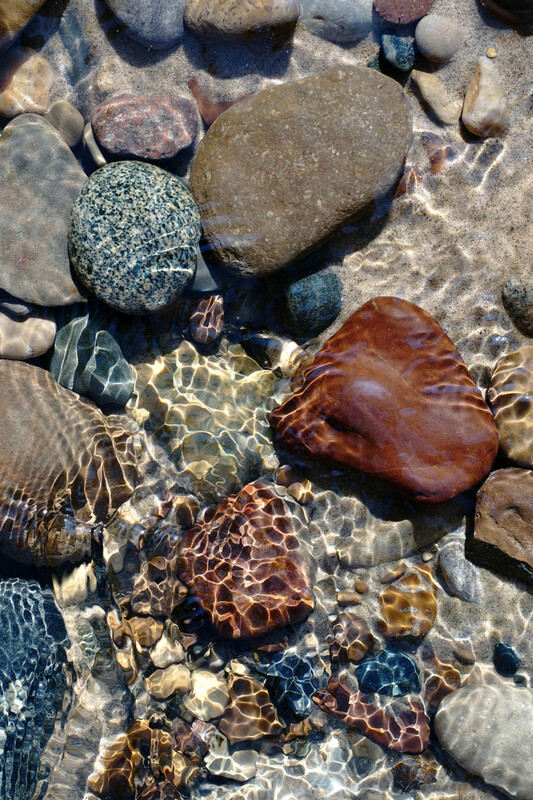 Sandstone rocks form in rivers, deserts, oceans or lakes. Jacobsville Sandstone or Redstone is generally red due to the presence of highly oxidized iron cement which binds together the grains of quartz. It's typically mottled with various pinks, whites and browns exhibiting either many streaks or spherical spots caused by leaching and bleaching. It forms a wide belt through Northern and Upper Michigan and was quarried rather extensively at one time used for building material to build the cities of Northern Michigan and elsewhere in the Great Lakes region. As with many stones formed elsewhere in Michigan, the big lake brings them southward to where I find them is lesser amounts. Estimates for the age of the Jacobsville Formation range is from the late Mesoproterozoic Era about 1.05 billion years ago until the Middle Cambrian Period. After some stubborn digging around, I finally believe I understand the difference between sand stone, silt stone, mud stone, clay stone and shale. They all fall under “clastic” sedimentary rocks formed by weathering breakdown of rocks into pebbles, into sand, then silt, and so forth (you get the picture) from exposure to wind, ice and water. At each step the particles become smaller with shale having the finest grain. All the clastic sedimentary rocks mentioned above are cemented very much the same way in which sand stone is pressed together. Silica, calcite, and iron oxides are the most common cementing minerals for silt stone. These minerals are deposited in the spaces between the silt grains by water. Over the course of thousands or millions of years, the minerals fill up all of the spaces resulting in solid rock. Silt accumulates in sedimentary basins throughout the world. It occurs where current, wave, or wind energy cause sand and mud to accumulate. 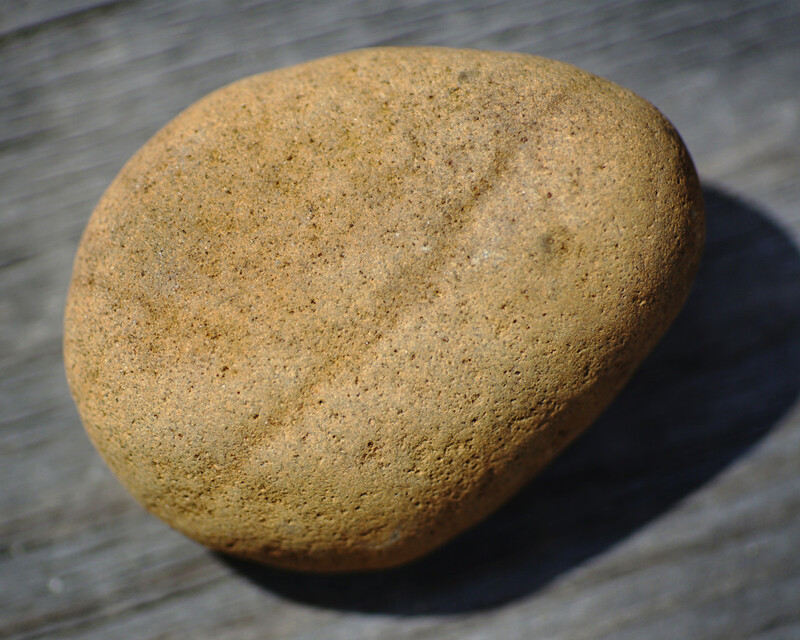 Silt stone is very similar in appearance to sandstone, but with a much finer texture. It has a gritty texture to it and is more difficult to distinguish the mineral particles. 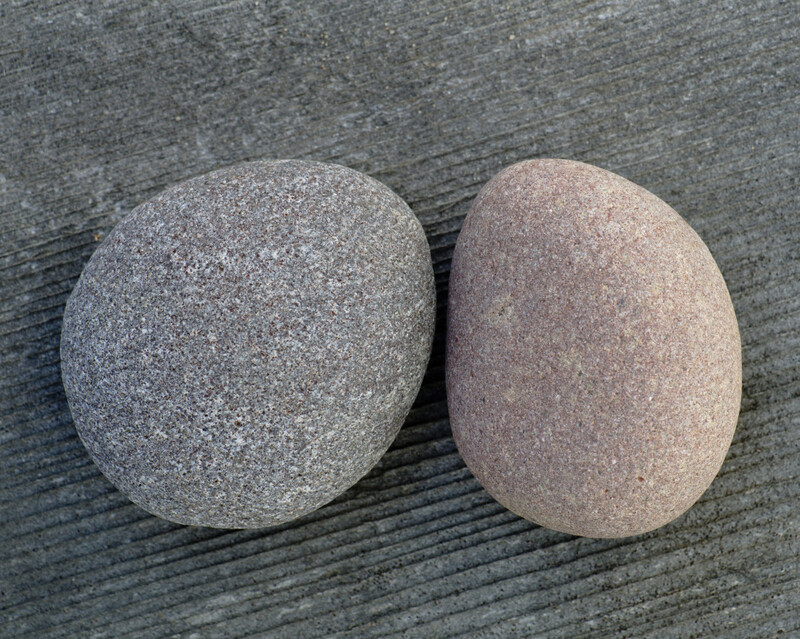 When handling silt stone, a residue the color of the stone can rub off on you hand. Silt stone is usually gray, brown, or reddish brown. 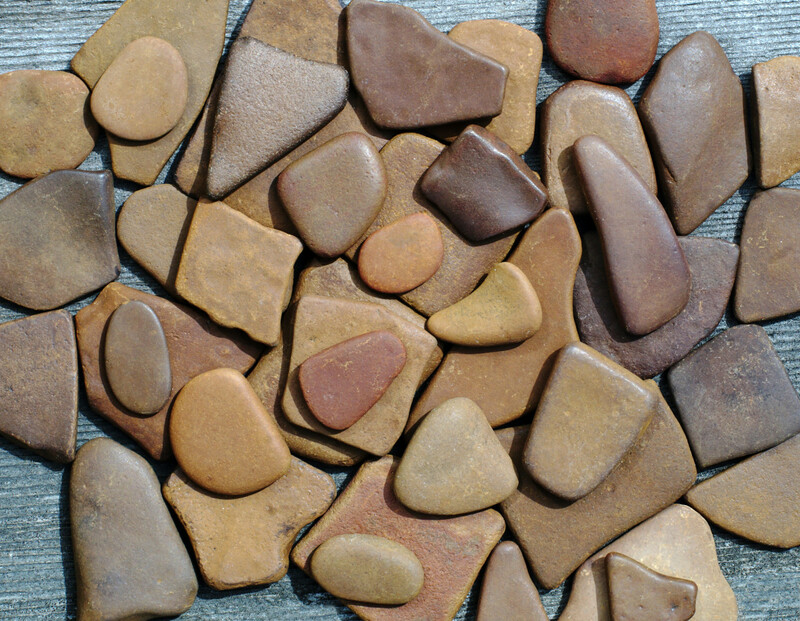 Silt stone can also be white, yellow, green, red, purple, orange, black, and other colors. The colors are a response to the composition of the grains, the composition of the cement, or stains from subsurface waters. I already described how mud stones and clay stones are clastic sedimentary rocks formed similar in the way as sand stone and silt stone. But I will mention that we especially find the brown mud stones on the beach. They are the same type of stone that form the septarian brown stones. Both the mud stones and clay stones wipe off a residue when you're handling them from their fine grained texture. The last stone in the chain of the clastic stones for the finest ground down grains, is slate, which we find very little of. This could be because slate breaks apart at parallel stratifications and perhaps because of the extreme ice, wind and wave action of Lake Michigan, they get demolished, but I can only guess. 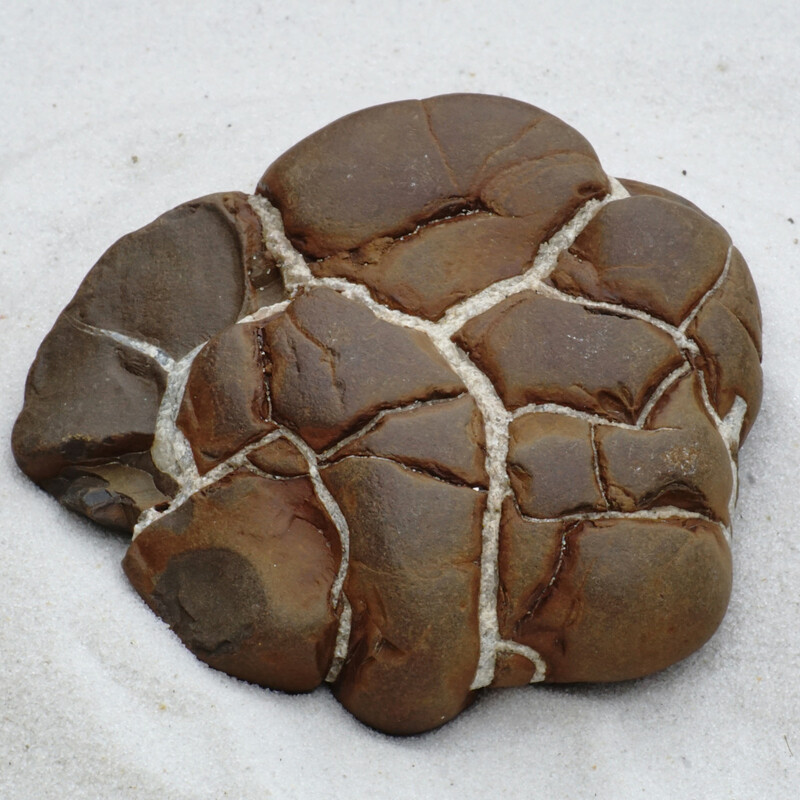 Geodes are one of the less common finds along the beaches, but it's very exciting when you do find one. They begin their formation as hollow rocks. As a volcanic rock, geodes start out as bubbles, but can also form in areas other than volcanoes. In sedimentary rocks, geodes can start out as animal burrows, tree roots or mud deposits which over time forms the hollow cavity within the rock while the outer edges harden and form a sphere. Mineral rich ground water infiltrates the cavity and many years in the making crystallize in various colors depending on the mineral content such as quartz and amethyst. Without being totally certain, I believe these pretty little stones are one type or another of the gemstone chalcedony. They are only as big as a penny and have a smooth, waxy texture. In order to spot these on the beach in Southwestern Michigan you have to look very closely along the shoreline where gravel is abundant, but I have found quite a few and they're usually tiny like these samples. Michigan's northern regions and upper peninsula are excellent places for finding agates. Chalcedony and Agates Explained . . .
Rock and minerals can be very complicated, but fascinating to study. For a bit of geochemistry about chalcedony and agates, it only makes sense to begin with the microchrystalline quartz, chalcedony. Chalcedony forms where water is rich in dissolved silica and flows through weathering rock. When the solution is highly concentrated, a silica gel can form on the walls of the rock cavities. That gel will slowly crystallize to form microcrystalline quartz (very small crystals of quartz) in other words, chalcedony. So why begin with chalcedony? Because agate as well as jasper are both varieties of chalcedony. They are considered gemstones. Chalcedony can be banded, have plume (fluffy inclusion), branching patterns, a delicately mottled surface of leafy green, honey brown and creamy white; or also have a mossy and other colorful structures within. It's often blue but can be almost any color. It's always translucent, never opaque or transparent. It feels waxy, greasy or silky. Both agate and jasper form somewhat differently from chalcedony giving them their unique properties. Many agates form in areas of volcanic activity and crystallize slowly in the cavities of igneous rock or limestone. 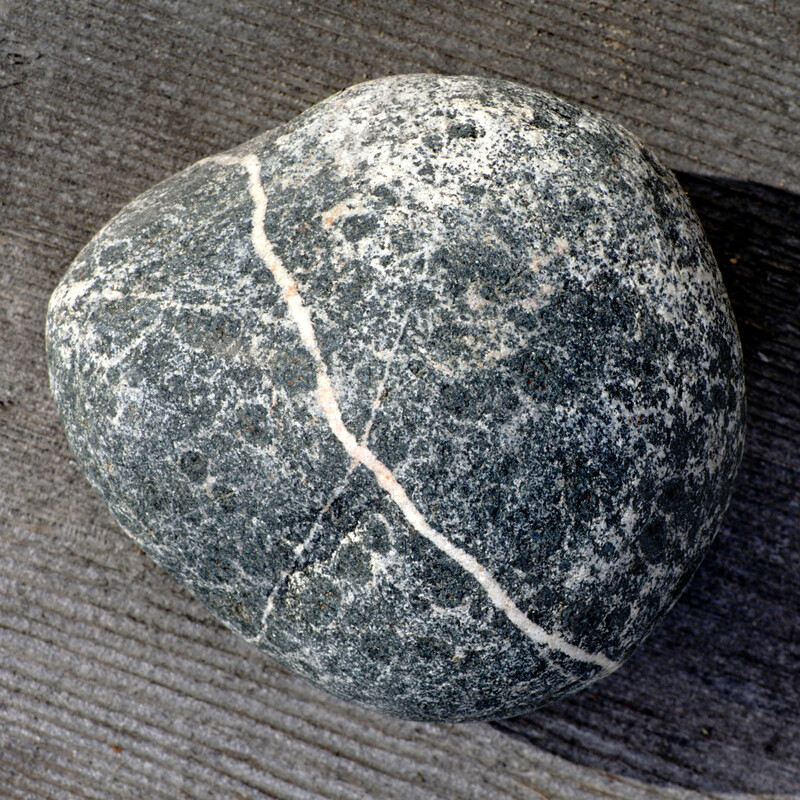 Jasper forms when fine materials are cemented by silica to a solid mass. These fine particles give jasper its color and opacity. How can you tell one from another? Agate is generally translucent to semitransparent and most often banded. 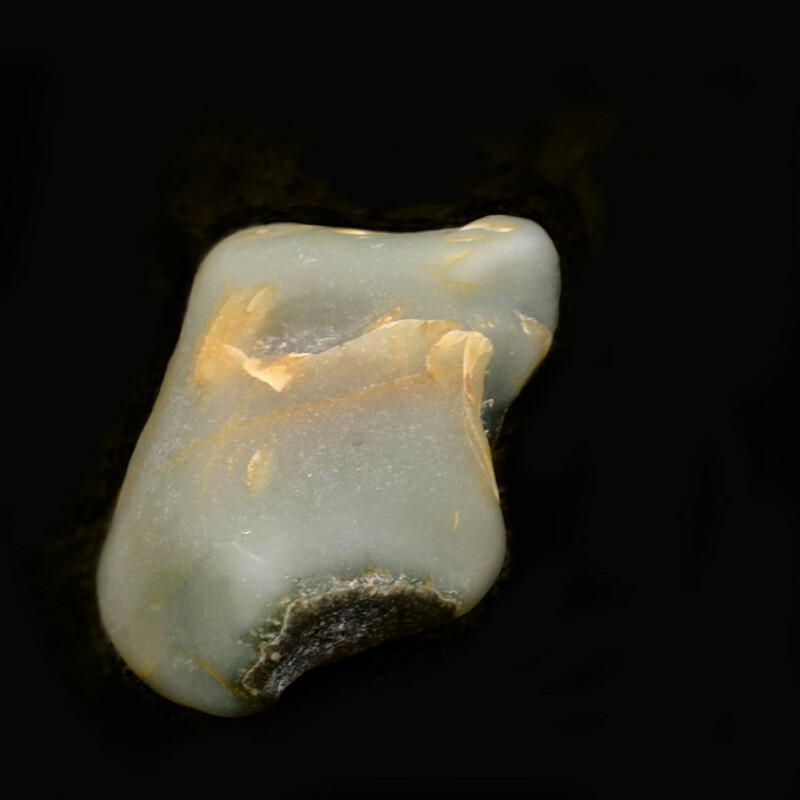 Observing bands in a specimen of chalcedony is a very good clue that you have an agate. However, some agates do not have obvious bands. These are more rare and often translucent agates with branching out mossy inclusions.Typically, an agate is the size of a golf ball and feels heavier than it looks due to its density. It also has a waxy feel to it. 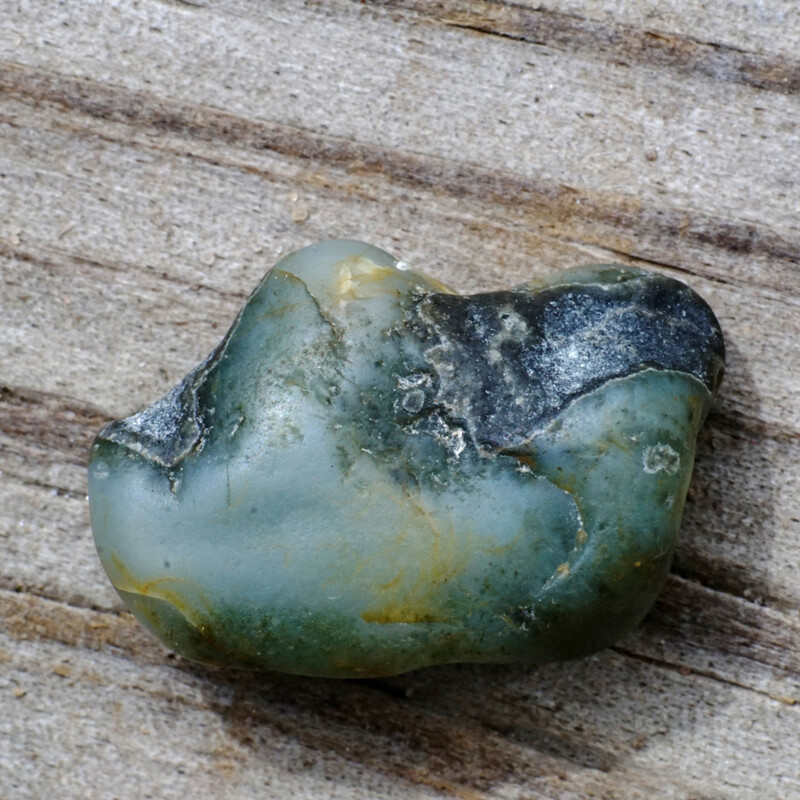 Jasper is opaque because it contains enough non-chalcedony material to interfere with the passage of light. So, the real difference between jasper and agate is the amount of impurities and foreign material contained in a specimen. Jasper is almost always multicolored, with unique color patterns and habits. Note: Chert, a sedimentary material forms in a similar way as jasper biochemically from silicon based marine skeletons of plankton, which is yet another form of chalcedony sometimes called jasper. I leave you with beautiful photos of Pier Cove Creek shone above and below. 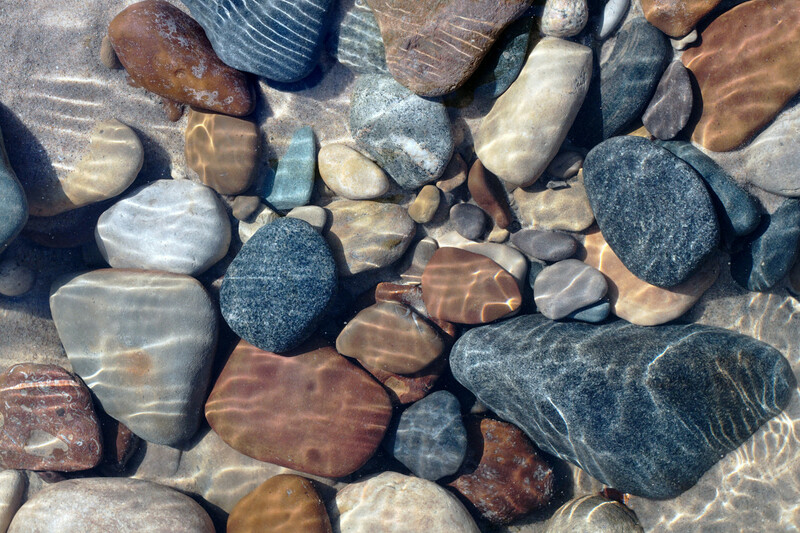 The creek flows into Lake Michigan in Southwestern Michigan and during the spring meltdown, the creek rushes into the lake with more voracity than usual, exposing the many buried rounded stones and pebbles. Listening to the trickling water and watching the tiny sunlit ripples continuously gurgle across the water is a delightful experience with Mother Nature herself. 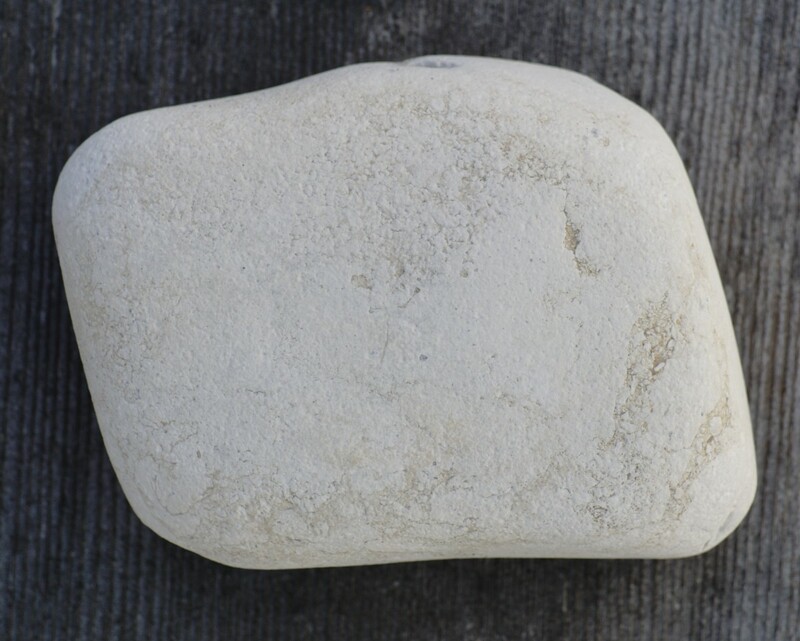 For more information about Lake Michigan beach stones, check out my follow up photo essay titled "I Found More Rocks on the Beach and Wondered". 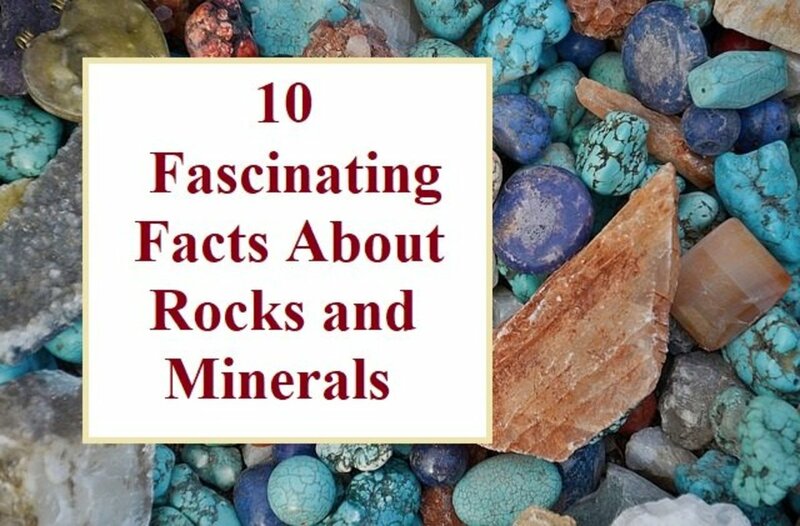 It includes facts and photos about syenite, rhyolite, pumice, dolomite, quartz, wishing stones, heart stones, quartzite, Presque Island serpentinite, diabase, pegmatite, conglomerates and banded metamorphic rocks! 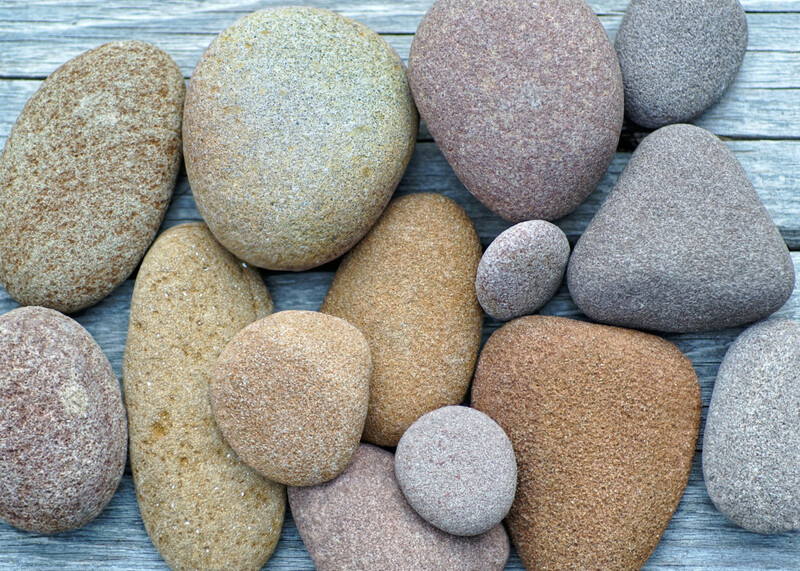 Which rocks have you collected the most? I have two very lightweight rocks that are black, opaque and, although they aren't shiny, they are shinier than most Lake Michigan stones and rocks I've picked up. For this area, I can't find what type they are. Can you help? It sounds like they could possibly be pumice. Is yellowing on the edge of a green chalcedony common? I found a white stone with a black crystal in the middle. I broke it open. Any idea what mineral it is? It could be a number of things, even amethyst can be black, obsidian is another one. Here's a link I found which could help! I found a white round rock on a beach. It is freckled with what appears to be silver glitter. It's quite porous. What is it? I found a black metal rock with black square metal rocks stuck on it, what could it be? Hi Kim, I'm intrigued about sand pearls! I haven't come across them myself, but if I do, I will let you know. I'll be on the look out! Hi Miriam, sand stone can have shiny minute particles, but not overall shiny. Hi Kari, I wish I had come across citrine, wow! Good for you. 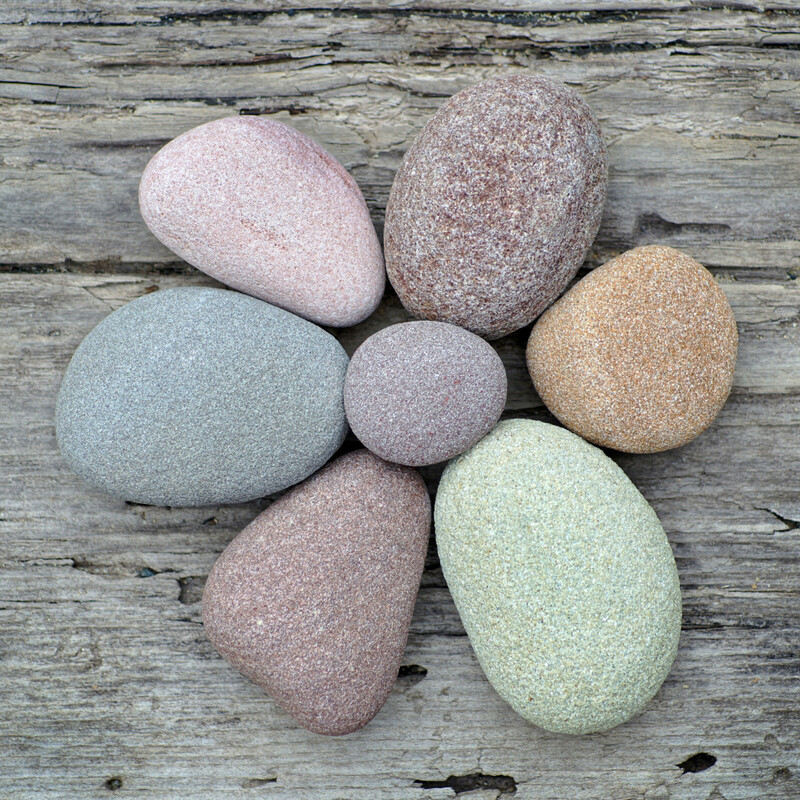 Are you finding these stones in the U.P. or northern Michigan? Hello Kathi - Sand pearls is what my friend called them too and her family has found them for a long time. I did see that guys post too about the microbeads and fear for the environment. I can't seem to get any info on what a sand pearl is! Thanks for getting back! Hello! Just discovered with a friend's help, tiny pearl-like stones on Lake Michigan shoreline. She called them sand pearls and has found them for a long time. On another site today, a guy thought they were plastic beads, like microbeads and he was furious and afraid for the environment! Have you ever come across any citrine? My son came across a good size piece and I’m almost certain it’s citrine. I’ve found carnelian, bloodstone, adventurine, tons of granite (which I thought were various types of jasper), and also stones that seem to be howlite? Does sandstone has a shiny texture like it's glittery?? A recent video came to me showing lava rock and dead fish turning up on part of the eastern shore of Lake Michigan. Reported by author as unprecedented or very rare. I googled it, but found nothing. Is this information correct? Hi Tamarajo, People love to look for agates in Minnesota and Michigan UP, but we don't have that many in southern Michigan. Anyway, I completely understand about coming across different rock types and wondering what the heck they are, lol! So much so that it nagged at me to do the research. There will be a follow up to this article with more rock types. I mostly look for agate, chalcedony, special kinds of Jasper, and fossils, in Minnesota. 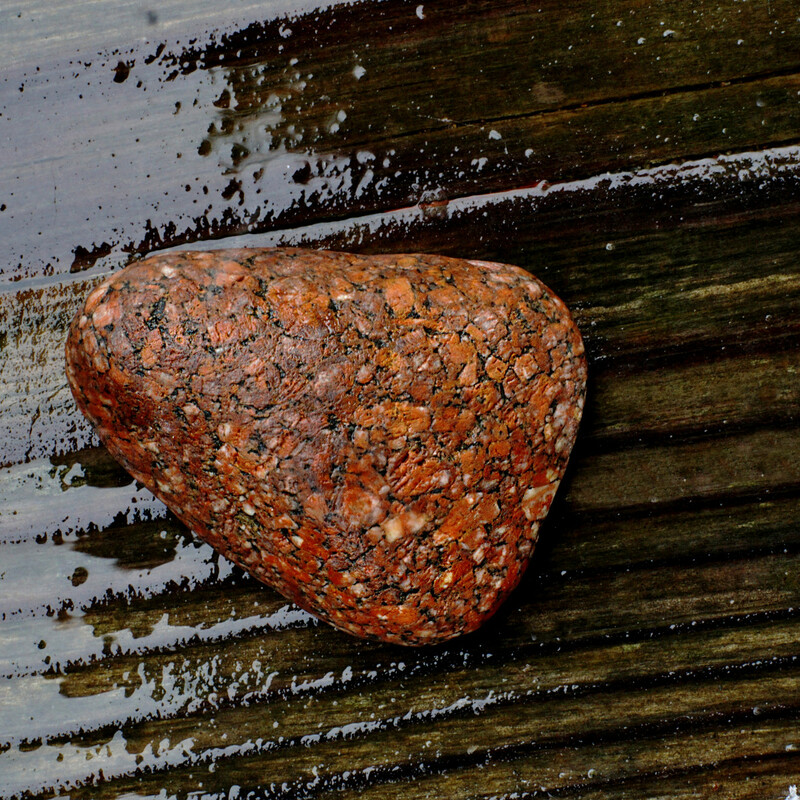 but I run across many different rocks like the ones that you have displayed and always wonder what they are, which made this an interesting read for me. I just may be referring back to this as the images and descriptions really are useful. Thanks for creating such an informative article and for sharing such lovely photos. Kathi. My father's rock collection includes some of the rocks that you've shown, but it's missing some of the wonderful specimens in your photos. I'll look out for them during my walks. Hi Kathi. Wonderful hub! Thank you for all of the information which is presented so well along with your great photography.It must have been a beautiful day! I've learned a lot. I have always been a shell collector but these are some beautiful rocks and I know I would collect them too if they were available to me. I especially liked the Michigan Septarian Brown Stones. Pink in a rock always draws my attention too, I have picked up an odd one or two to go around flowers. Very interesting and I know I could live with that view! Thank you Susan, I love the same thing about granite and the swirls of pink with black and white! Wow! 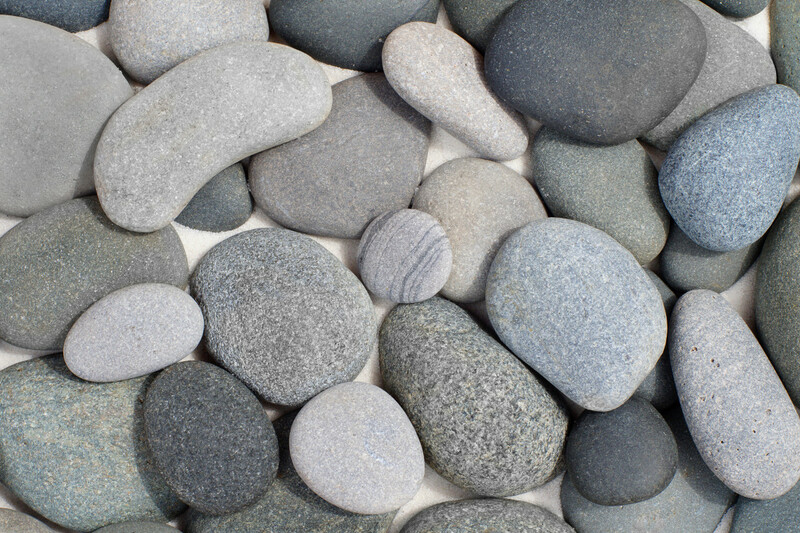 These are some very precious rocks. I love the texture and the look of granite. Thanks for sharing.